Big Rigs 'n Lil' Cookies: Boiled What? Boiled Peanuts? To give you a little background on my love for boiled peanuts, I first learned of them on Paula Deen's show, back around 2004. I tried my best to find a video clip of this episode to share with you, but all I could find was this excerpt of her actually making them. It was interesting. I had never heard of such a thing. Living in Minnesota back then, and still being fairly fussy, cooking wild rice in a new hot dish was on the edge for me, boiling peanuts sounded like pure craziness. Part of the reason I remember this Paula Deen episode so well is that I saw it shortly before my first trip as an adult to South Carolina. During that trip, I visited with my cousin's family in Upstate S.C. While out seeing the sites and learning the area, I can remember being at a Peach Farm, and while driving away, asking my cousin about this "boiled peanut thing" I saw on the cooking show. We whipped around in the road and went right back to the peach farm where they sell boiled peanuts. Plain and Cajun style. They sell them in big styrofoam cups (the same cups we would get coffee or soup in here in the Midwest). Dear ol' cuz got me a huge mug of both to try. I was so excited to try them. Here is this mug full of steaming boiled peanuts. I'm sad to say, I hated them. It was just to much. Peanuts were supposed to be dry, cold (or at least room temp), and DRY! Oh well, at least I tried, right? While heading for home a day or two later, a couple of hours down the road into Tennessee, I kept thinking about them and decided that I did like them. It was just the shock of it all.....I needed more boiled peanuts! Thankfully, I found one gas station that sold them and was able to munch away going down the interstate. I've been in love with these boiled peanuts, ever since. If any one in my circle heads south, there is always the request to bring back as many as they can for me. I can find canned boiled peanuts locally, but they just aren't always the same. 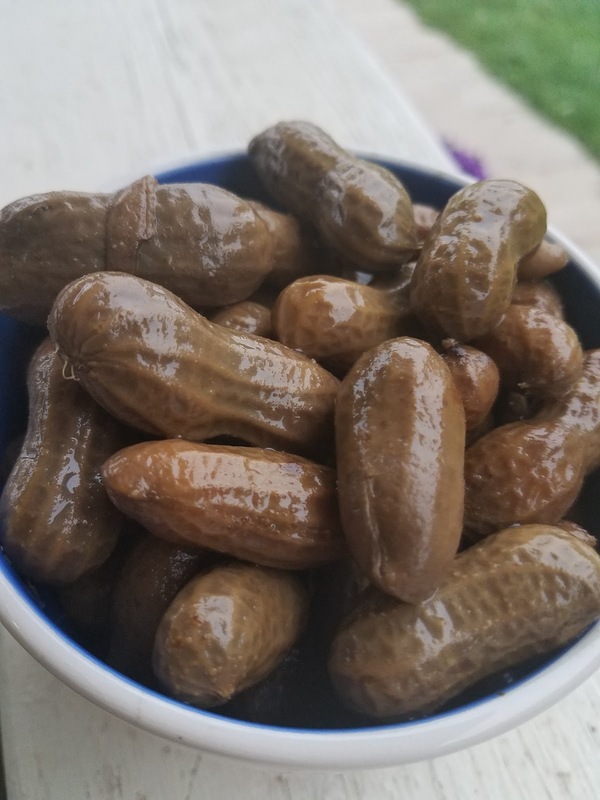 I've made boiled peanuts a couple times, but getting the right raw/green peanuts shipped to Wisconsin when you are such a novice can be a gamble. A couple days later I had a wonderful package waiting on the porch. AND.... Lynn added the bonus of Cantaloupe Jam! And, just to show you the power of the south, and the southern cook... 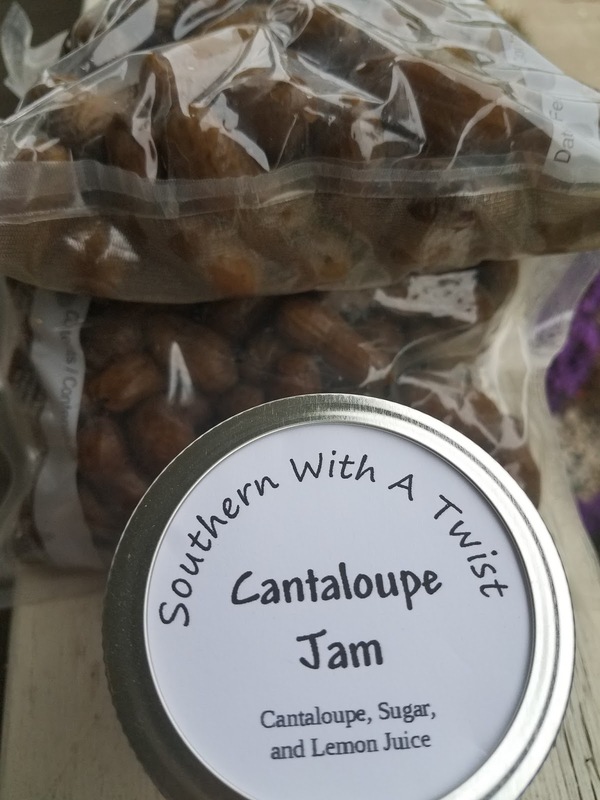 I am a person who does not care for Cantaloupe, but Lynn makes a mighty tasty Cantaloupe Jam, and I will try her cantaloupe foods any day! Soon, I'll tell you about when Cousin Donna shocked my world with a cheese sandwich! You just never know what you'll get in South Carolina! Have you ever had a boiled peanut?? That's a childhood favourite! My mom usually boiled them with salt and spices..really tender and delicious. Angie ~ Do you remember what kind of spices she used? 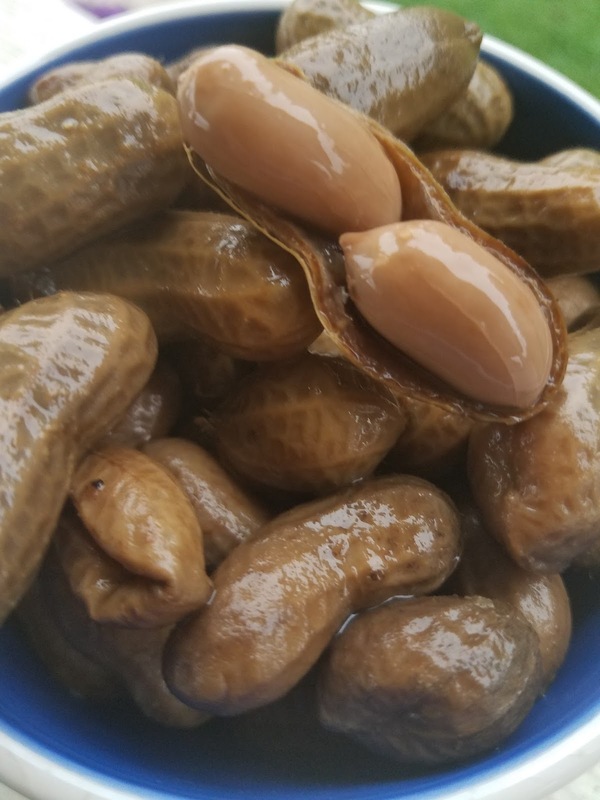 I have never had a boiled peanut, but I would love to try one after reading your post. How fun. I love to try foods from different areas. And, with your love of fruits, I bet you would love the jam! I have never had a boiled peanut either! How have I made it this long?! We talk about them occasionally and think about it, but it has yet to happen! Now I feel like I am missing something even more than before. I suppose a road trip is in order. 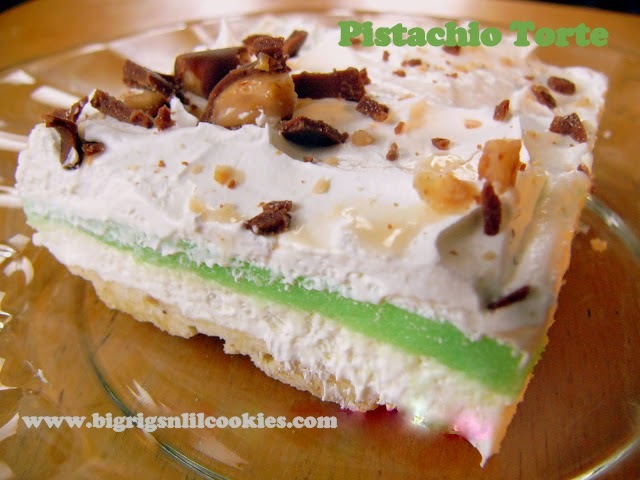 I'm afraid if I try to make them myself I'll mess it up and ruin any chance I had of liking them! Now I need to know more about the cantaloupe jam as well! I know you would make them to perfection, but it always helps to have an idea of what the end result should be! I had my first boiled peanuts a few years ago, in Alabama. I have a can in the cupboard, but I haven't tried them yet. I wish I could find someone to send me some green peanuts!! I also love grits, fried greem tomatoes and Shrimp and Grits! Truth be told, I've never tried green tomatoes, but I am with you 100% on the Shrimp and Grits!! Well I'm not so sure these would be something I'd enjoy but you never know. That's for sure, Ida. You just never know! I've never had one but I bet I'd love them because I do love PEANUTS! you definitely can't drive anywhere in sc without being bombarded with billboards for boiled peanuts!! Never tried a boiled peanut but you made me curious. Never tried boiled peanuts before though I have to say I love most any kind of nut. Will definitely have to try. I discovered boiled peanuts about 15 years ago roadisde-my best friend loved them and encouraged me to try the. Been hooked ever since! Just on a bit of a break.Merry Christmas, Carole! I can't believe it - I've often wondered about boiled peanuts, and any time I see or hear them mentioned I have every intention of looking it up but never do! Thanks for the info.